In winter, when it’s cold and you don’t have many fresh vegetables available, you can easily make a great variety of dishes from simple potatoes! 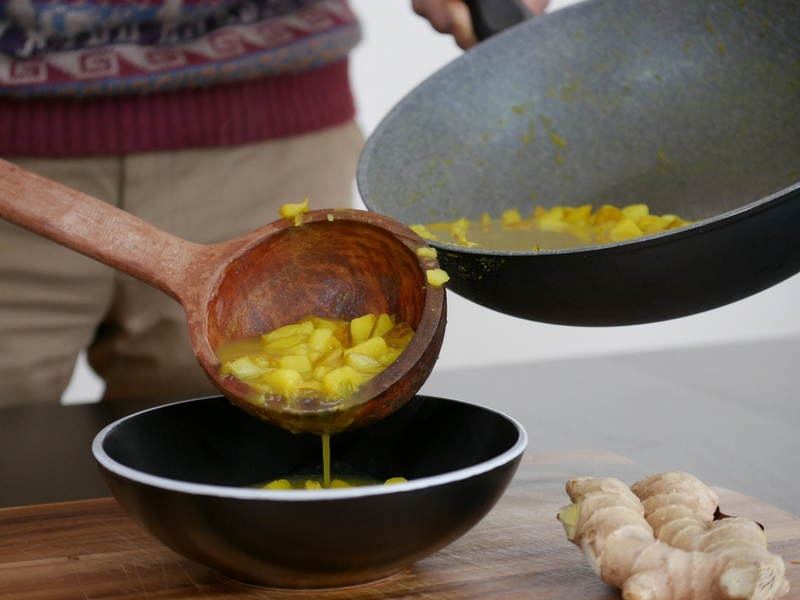 Today we want to share with you our family recipe for Potato Ginger Soup with Turmeric. This soup is not just extremely easy to make and irresistibly delicious, but also a wonderful remedy for cold, soar throat or cough. Try it, and let us know how it came out! Step 1. Soak potato in cold water for 15 minutes. Step 2. Meanwhile, make a paste from ginger and green chilli: chop them, add some water and than process the ingredients in a blender, a food processor, or use mortar and pestle. Step 3. Heat some oil in a pan and add your ginger-chilli paste, mix it nicely so that the paste gets covered in oil. Step 4. When you start feeling the aroma of ginger and garlic, add chopped potatoes and mix thoroughly. Step 5. Add water, mix everything, cover with a lid, and cook for about 20 minutes, until potatoes are cooked. If necessary, add more water during the cooking process.